My wife was worried. My mom was worried. Even my nine-year-old daughter was worried. And yes, I too was a little anxious as my departure date for Tokyo drew closer. I'd never been to Japan before, so the thought of making my own way through customs and then from the Tokyo Narita airport to the Keio Plaza Hotel more than an hour away was a bit concerning. Would I find people who spoke English? Would I have any trouble exchanging my dollars for yen? Would I get on the right shuttle bus to the right hotel? Even though I assumed everything would work out fine, it all was a little intimidating for an Ohio guy who spends most of his days working from home and carting his kids to and from school. And then, there was that whole marathon thing to worry about. I spent a couple hours in a local ER getting treatment for severe dehydration following the Chicago Marathon last October, and my body powered down for a quick nap in the chute after the Arizona Marathon in January. Needless to say, I was hoping to avoid any such experiences in the Tokyo Marathon, considering I would be in a foreign-speaking country more than 7,000 miles from home. The less post-race drama, the better, and I hoped my body would more easily handle 26.2 miles the third time around. The good news is, I didn't wind up in a Tokyo hospital last weekend. Even better, I had no trouble finding my way to the Keio Plaza Hotel upon my arrival, and I even found a small Italian restaurant for a traditional pre-race meal Saturday night. The people of Tokyo -- from the hotel staff and the workers at the Shinjuku train station to the more than 2 million spectators who lined the street during the race -- were friendly, helpful, patient and incredibly gracious. Many of them even spoke English (to varying degrees), which was a bonus for a Yankee like me who only knew how to say "thank you" in Japanese, and I even screwed that up repeatedly on my first day. The bad news? I didn't run as well as I'd hoped, but after the unbelievable week I had in Japan, I'm not really complaining. I've learned something about marathon running in each of my three races, with the main lesson from Tokyo being that I can never just assume that I'm drinking enough water along the way. I went into the race confident that my modified hydration and nutrition plan was sound and would help lead me to a PR if I just ran a controlled race, but evidently I didn't take in enough water in the later stages and faded badly down the stretch before battling severe nausea once I crossed the finish line. The Japanese version of Gatorade brought me back from the dead, thankfully, and ensured that an otherwise fantastic day would not end on a very unpleasant note. I'm frustrated with the finish, but it didn't tarnish the experience. 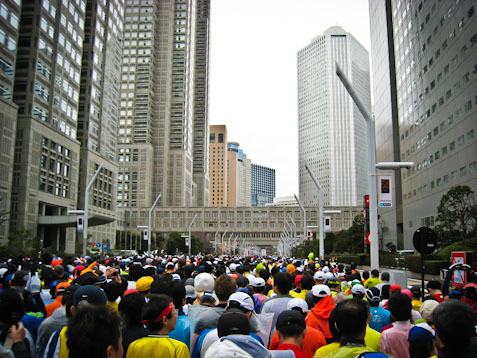 More than 36,000 runners gathered in the street in front of and around the corner from the Tokyo Metropolitan Government Building, a majestic two-tower structure that now has served as the starting point for each of the six Tokyo Marathons since 2007. At 9:10 am local time, we heard the starting gun from all the way back in corral G and slowly made our way toward the starting line. Eight minutes later, my race had officially begun. The energy at a race of this size is always intoxicating, but the amps seemed to be cranked up even more Sunday morning. The whole city was buzzing, and I felt honored to be in that place, in that moment, however insignificant my role would be. I snapped a few pictures as we crossed the starting line, went to deposit the camera back into my pocket and then realized I was better off strapping it to my wrist and just keeping it on standby. Every curve in the road brought a new memory begging to be captured, from the sea of runners rising and falling in front of me and the 10,000 cheerful volunteer members of McDonald's Team Smile, to the landscape of colorful buildings and street signs and the spectators lining the course in crazy costumes, holding up homemade signs and taking high-fives from any runner willing to give them. The runners themselves took part in the fun, with countless participants dressed up in outrageous gear, including one guy who ran as Jesus Christ, cross and all. (The proof is in the slideshow at the top of the page.) And every few seconds, I heard someone yell “Ganbatte!”, a traditional word of encouragement loosely translated as, “Do your best!” The word still echoes in my mind almost a week later. My head was on a swivel, enjoying the sights and sounds with a goofy grin on my face and taking picture after picture after picture (after picture), all while darting through the heavy congestion and trying to stick reasonably close to an 8-minute per mile pace. Unfortunately, there were no mile markers on the course, as we've all grown accustomed to here in the States, so I tried to settle into a pace of about 25 minutes per 5km, a plan that worked well in the early stages and allowed me to largely ignore the clock as I made my way through Tokyo, passing the Imperial Palace, the Tokyo Tower (above) and the Zojoji Temple along the way. Before I knew it, I was 20km into the race with the halfway point approaching. Because I was just six weeks removed from the Arizona Marathon, my legs weren't as fresh as I'd hoped coming into Tokyo. I held up fine through 25km but began to lose some steam after that. I wound up taking more than 300 photos during the race -- many of those unusable shots of the road or of blurry landmarks sitting behind even blurrier runners -- and considering how few of those came during the second half when I had trouble finding the energy to raise, point and shoot, I'm guessing the photorunning at least partially contributed to my slow finish. Still, I wouldn't do things differently if given the opportunity. These pics will last a lifetime -- I even stopped at one point when another runner offered to take a picture of me in front of the Tokyo Sky Tree (below). I'll have other chances to run a PR, but I wouldn't have had another chance to get that shot. As usual, the last several miles were a struggle, made even worse by the creeping dehydration. I'm a sweater -- not in a Bill Cosby kind of way, but in a "what's with all the crusted salt on your face?" kind of way -- and apparently I need to take in even more water than I thought during a marathon to avoid crashing and burning. Nevertheless, I eventually dragged my carcass across the finish line in 3:59:25, fought back against my gurgling stomach and then slowly made my way through the chute to the gear check area, where volunteers applauded every runner as they came through to pick up their bags. On my way out, I noticed crowds of runners enjoying some time in an ashiyu ("foot bath") and minutes later, I pulled up a spot and dipped in my feet. Ahhhh…. Who do I talk to about bringing these to the US? I was still feeling the post-race effects in the hotel lobby Sunday evening when a Japanese man approached and asked if he could take a picture of the medal hanging around my neck. He told me (through an interpreter) that he was one of the more than 300,000 people who applied for the 2012 Tokyo Marathon but he wasn't accepted. He stared at the medal, awestruck, telling me that I was fortunate to have been one of the 36,000 runners on the course that day. He said he hoped to get the same opportunity someday soon, and then asked how I ran. When I told him my time, his eyes widened and he provided me with my biggest laugh of the weekend, asking if I was a professional runner. Not wanting to insult him, I hid my amusement as best I could and thanked him for the compliment, but told him there were many, many other runners who finished ahead of me. His reaction to seeing my medal and his deep desire to run the Tokyo Marathon himself one day proved that the organizers of this young race have built something special in a very short time. We learned during a symposium Friday night that the Tokyo Marathon hopes to one day be listed among the other World Marathon Majors, alongside legendary races like the New York and London Marathons. After what I experienced last weekend, I'd say it's only a matter of time. Of course, I can't end this without thanking the Tokyo Marathon Foundation and our guides during the weekend for their incredible generosity. When I signed up for my first marathon a year ago, I never would have guessed I'd be given the opportunity to run a race halfway across the globe. I met so many amazing people, including several runners who have competed in dozens of races around the world. I can only hope to be fortunate (and healthy) enough to try something like this again someday, but after spending the past year training for one marathon or another, I'm just looking forward to a break. I’ve only run three marathons, but one of those was Chicago, one of the five World Marathon Majors, and Tokyo sits atop my admittedly short list. Granted, the race today was a wholly unique experience for a foreigner like me, but the 2012 Tokyo Marathon was energetic, welcoming, challenging and tons of fun, a sentiment that everyone from our press tour (pictured above) shared as well. I’ll be posting a more detailed recap next week, along with a boatload of pictures (I snapped more than 300 alone during the race today), but that opinion won’t change. The more than 2 million spectators were thrilled to be cheering on 36,000 runners this morning, no matter their nationality, and there were all sorts of costumes and signs alongside the course to help the runners briefly take their mind off the demanding task at hand. The course itself was spectacular, and though we took a guided bus tour of the course yesterday afternoon, there were still so many things that caught my eye (hence the 300 photos). From all the colorful signs in the various parts of the city to the Tokyo Tower (below), the Imperial Palace, the Tokyo Sky Tree and Thunder Gate, there was no shortage of landmarks and other memorable sights to grab the attention of even the most focused marathoner. Unfortunately, I didn’t run as well as I had hoped, finishing at 3:59:25 (unofficial), but as I’ve said all along, this race was about much more than my watch time. This is one I’ll remember for the rest of my life, as I was wowed by the hospitality of the people of Tokyo and the surrounding areas. The race was fantastic, and the city is even greater. As the Tokyo Marathon positions itself to join the list of the world’s elite races, any marathoner has to put Tokyo on their to-do list. In just about 11 hours (7:10pm EST Saturday night), the 2012 Tokyo Marathon will begin, and I’ll be one of the 35,000 runners in the field. It’s still hard to believe that I’m here, sitting in my hotel room at the Keio Plaza Hotel, waiting to a marathon in Japan. The experience so far has been everything I imagined it would be, and we haven’t even hit race day yet. As I mentioned in my previous post, the members of the press tour began our day with the International Friendship Run, a 2K fun run set up to allow international runners (and their family and friends) a chance to meet one another the day before the marathon. I won’t lie — the weather was downright crummy, with temperatures in the low-30s combined with steady rain making for a dreary morning — but the organizers, as they have all weekend, still put on a great event. Hopefully the weather cooperates for future International Friendship Runs, but if it was going to rain at all this weekend, we’re all glad it happened Saturday and not Sunday. After we all toweled off and changed, we were taken on a bus tour of the marathon course, led by our tour guide Maya san, who did a marvelous job showing us all the sights Tokyo has to offer along the course. We stopped for a traditional Japanese lunch and took some photos outside the amazing Thunder gate in Asakusa, which I’ll post with my recap next week. The tour wrapped up at the finish line for the race, and we all piled out of the bus and into the race expo at Tokyo Big Sight. I’ve been to my fair share of race expos, but I’m not sure I’ve ever seen one quite like this. The building was buzzing as runners from all over the world made their way through the various booths, with highlights including the newest offerings from Asics as well as an impressive display at the BMW booth. We picked up our race bibs (I’m #36054, if you’re curious) and made our way through the sea of people at the Tokyo Big Sight, picking up some mementos along the way. Then it was back to the hotel for a little R&R before race day. I managed to find a small Italian place around the corner from the hotel for my usual carbo-loading dinner before heading back to the hotel to get all of my gear ready for the race and, well, to write this blog post. I’ve met a ton of great people from all over the world this weekend, with representatives from places like Italy, Spain, the UK and Australia also taking part in the press tour. Now comes the hard part: the race itself. The weather should be cold but clear, which is welcome news after this morning’s sogginess. I have a time in mind that I’d love to beat but I’m more focused on enjoying the moment and taking in as much of the experience as I can. If I can do all three? Well, that would be the perfect end to an amazing weekend. It’s been a fun couple of days since I arrived in Tokyo Wednesday evening, highlighted by my self-guided tour around the city yesterday afternoon in advance of the 2012 Tokyo Marathon Symposium that the members of the press tour attended Thursday evening. Representatives from three of the world major marathons — New York, London and Berlin — spoke in great detail about the recent explosion in popularity of running in general and marathons in particular, looking ahead to what challenges face the major marathons and what goals the sport as a whole has in mind going forward. Tokyo, with 35,000 runners selected from more than 300,000 applicants, hopes to join the list of major marathons in the coming years. This will be the sixth annual race, and the organizers hope it will be the best yet. I’m about to head out into the rain for the start of the International Friendship Run, a 2K fun run set up for international runners the day before the race. Then it’s off to the course for a preview of the race and then to the expo to pick up my race gear. I hope to check in later this evening with more details prior to the race tomorrow morning (or Saturday evening at 7:00 pm EST, to those following along at home). As if running a marathon isn’t stressful enough, I’m traveling more than 7,000 miles this week to run another 26.2. I’d be lying if I said I wasn’t nervous about participating in the 2012 Tokyo Marathon this weekend (the race begins Sunday morning in Tokyo, Saturday evening in the States), but I’d also be lying if I said I wasn’t insanely excited. I’ve never been to Japan so the trip alone will be a thrill, but running a marathon on foreign soil will only add to what is sure to be a memorable experience. In my Tokyo Marathon Preview, I outlined the basic schedule for this race weekend, with a full slate of events as a member of the press tour culminating Sunday morning at 9:10 local time with the start of the race. As that starting line approaches, I feel fortunate to be worn out but generally healthy after 12 straight months of marathon training and countless Sunday long runs. However, while I have my health heading into the sixth annual Tokyo Marathon, I also have some concerns. For starters, I’ve never been much of an Asian food fan, which poses a potential problem when trying to fuel my body in the days leading up to the race. That’s not to say I won’t try different foods while I’m in Tokyo – when in Rome, right? – but as picky as I tend to be with my meals leading into a big race, I’ll be on the lookout for chicken and noodles more often than not. I’m also packing a few food comforts from home in case I have more trouble than anticipated with the local fare. I’m also curious to see how my body reacts to the 14-hour time change. If my trip to South Africa a couple years ago was any indication, I should adjust relatively well once I’m in Tokyo and be grab a couple good nights of sleep heading into Sunday morning. If not, well, I’m sure I wouldn’t be the first sleep-depraved person to run a marathon. My goal is simple: Enjoy the moment. As I mentioned previously, I’m planning on snapping a few pictures during the race, and rest assured I’ll be taking in as much of the city as I can during my free before and after Sunday’s festivities. I’m still in the process of figuring out what my body needs to compete at a high level during a marathon, and I’m hoping my new in-race nutrition plan (thanks to my triathlete buddy for the advice) will help me shave some time off my Arizona Marathon PR of 3:44:10 from last month, but I won’t be too concerned with my watch, not when I’ll be adjusting to a multitude of unique circumstances. I just want to finish, and have a blast doing it. Be sure to check in throughout the weekend as I update this live blog with some details from my Tokyo visit, and then come back on Friday 3/2 to read my complete recap with some photos from the trip! In the meantime, I figured I’d share the view from my hotel room in downtown Tokyo. Time to get some sleep!